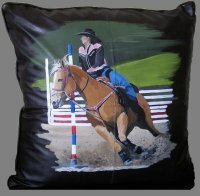 Custom Equestrian Portraits Painted on Slate, Clay Pots, Mailbox Covers, Canvas & More! IS HERE AND READY TO HANG! Send in Your Photos and have Your Horse & Child painted on Christmas Ornaments, Slate Signs, Canvas, Mailbox Covers & More! Abstract horse print. The mix of bright colors are stunning! 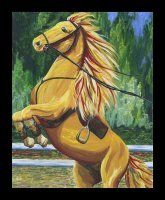 Horse lovers will go crazy over this giclee print on canvas! 24x30" Wrapped Canvas on Stretcher Frame and Ready to Hang. "Hot Trots" Abstract horse art of Dressage Quad Drill Team. 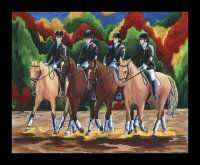 Custom painting of dressage team on canvas from your photos. Giclee is 24x30 on Stretched Canvas and Ready to Hang! Abstract Teal Horse painted Welcome Sign on 8x16" slate. Sealed for outdoor use. Leather strap included. Name included on bottom of sign. Other colors available upon request. $80.00 plus $15.00 shipping. "Saddle Up" Original Abstract Horse Art Giclee. 24x30" Stretched on Canvas and Ready to Hang.